Premium Semi-Synthetic Multi Metal Metalworking Fluid with improved lubricity leading to improved part production, improved tool life and reduced fluid consumption. BENZ KOOL 1300 Machine Oil has provided a variety of customers these overall benefits in their manufacturing process – improvement in parts, reducing cycle times, and reducing total operating costs. Large and small, customers machining aluminum and ferrous metals, in a variety of applications have benefited from BENZ KOOL 1300. 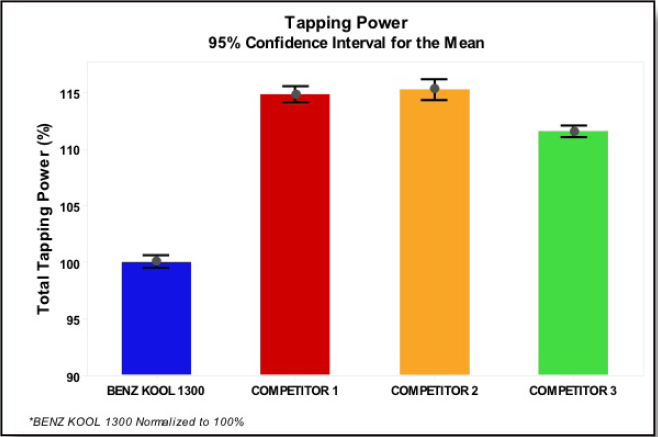 An extensive machining study compared BENZ KOOL 1300 machine oil against three competitive fluids on their ability to form tap 6061 T6 aluminum blocks. Power consumption – a strong indicator of lubricity levels – was 10+% lower for BENZ KOOL 1300 against current market leaders. Improved lubricity leads to improved part production, improved tool life and/or reduced fluid consumption. Pictures of the form taps provide additional indication as to the lubrication properties of BENZ KOOL 1300 compared with the competition. BUE (built up edge) is the bonding of metal from the part welding onto the tool causing ineffective tool operation and manufacturing of the part itself. Lubricity and cooling both play a role in form tap effectiveness. Interested in BENZ KOOL 1300? Maintaining a machine oil cutting fluid should never pull resources away from production. The Benz team of specialists work cooperatively with manufacturers to develop the best practices that ensure low maintenance and high value. Contact our team of experts to find the right solution for you.